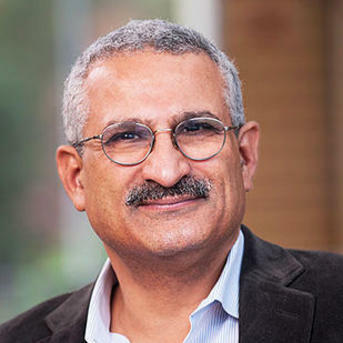 Professor Ragui Assaad has made outstanding contributions to global education and international capacity development as a researcher, teacher, scholar, administrator, and manager. Spending his early life in Egypt, he has focused most of his scholarly work on human development and labor market issues in the Middle East and North Africa (MENA) region. After earning his master’s degree in Mechanical Engineering from Stanford University in 1981, Dr. Assaad worked on institution-building and community organizing among Cairo’s informal garbage collectors. He later went back to school to earn a Ph.D. in City and Regional Planning from Cornell University, where he wrote a dissertation about the construction labor market in Egypt. Dr. Assaad first came to the University of Minnesota’s Humphrey School of Public Affairs in 1990 as an assistant professor of planning and public affairs. Over the last 25 years at the Humphrey School, he has taught numerous courses on international economic development, planning and policy analysis. He has also made a name for himself as a distinguished scholar, having produced an extensive body of work on labor markets, as well as international development and poverty in the MENA region. He has written or edited more than six books, over 30 peer reviewed journal articles, and dozens of book chapters. He has also authored several reports for international agencies, including the United Nations Development Program, the World Bank, the International Labor Office, and the International Food Policy Research Institute. Aside from his scholarly contributions at the University of Minnesota, Dr. Assaad’s global engagement includes service on numerous high-level advisory boards and mentoring of junior colleagues. He also has led training workshops and courses in Egypt, Morocco, Jordan, Turkey, Kuwait, and elsewhere. Dr. Ragui Assaad has developed an outstanding reputation as an influential scholar in human development and labor market issues and is a major contributor to the University of Minnesota’s reputation as one of the world’s leading institutions in planning and public affairs. 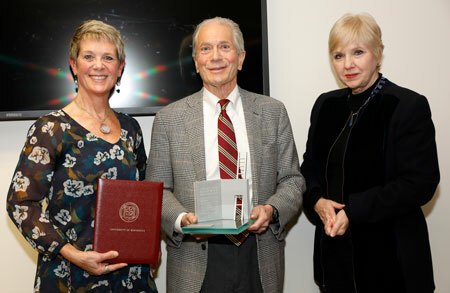 nominator Robert Kudrle, pictured here with Dean Meredith McQuaid and Provost Karen Hanson.